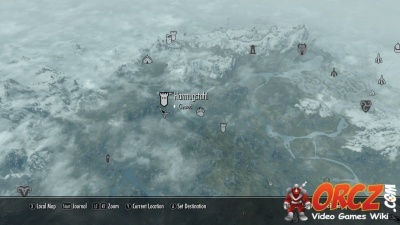 Harmugstahl is a dungeon in The Elder Scrolls V: Skyrim. As you enter the Dungeon, you will find an Adventurer. He will talk to you about the Frostbite Spiders in these ruins. The spiders seem to be enchanted. Just how, he does not say. This chamber has two other dead Frostbite Spiders. 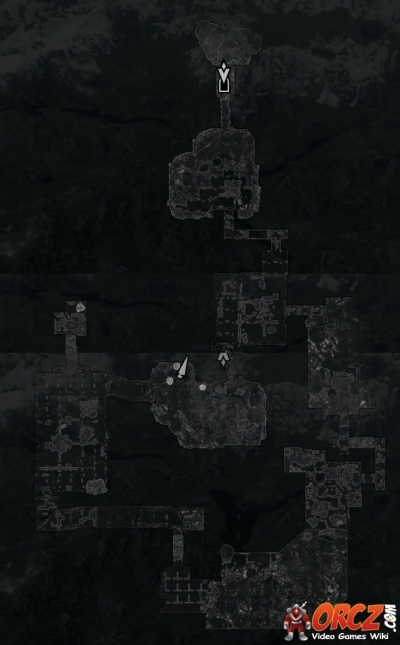 Each will be cloaked in fire after you loot them for their Frostbite Venom. Search around the room to find a satchel for more Alchemy Ingredients against the North wall. Head to the Southwest corner after that. There is another Dead Frostbite Spider. On the nearby table you will find a random stamina potion and a Potion of Resist Fire. To move forward you will need to head over to the Eastern wall. There is a lever sitting just to the left of some raised bars. 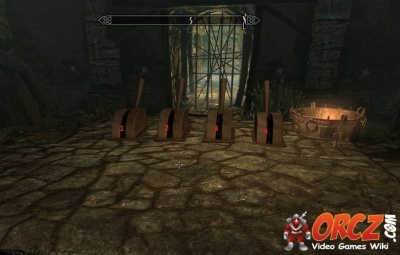 Interact with it to lower them down and allow access into the rest of the dungeon. This leads to a second chamber. This one has a 4 levers that you will need to activate in a particular order to progress forward.. You will need to activate 2 switches to clear the way. Just interact with lever 1 and 4 to clear the forward through all the bars. This leads to a passage with an attached room. In the main room you will find an Alchemy Lab. It has a locked room in the Northwestern corner (Expert level). You can find a chest and a number of potions and poisons along with the chest. After that turn to the South. Head to the South and into the large room. There are 4 more Frostbite Spiders in this room. Some of them are Ice Cloaked and some are Fire Cloaked. Defeat them then head to the West. You will find a webbed over doorway. Hack through it or burn through it and continue to the West. After that, turn to the North and head up the stairs. Head over to the West and then go back to the North. This leads to a large room with a mage below you. He has a number of Frostbite Spiders in a cage. This mage is Kornalus. He is an Altmer who has been experimenting on Frostbite Spider. Head to the North after that. You can use the Kornalus Frey's Key to get into the room beyond. This leads to Kornalus' room. 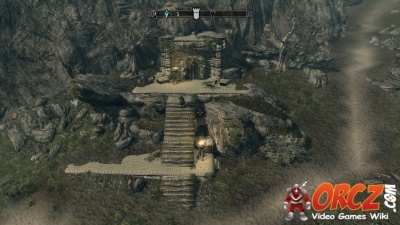 Here you can find a Shrine of Julianos. You can get this blessing and collect the Boss Chest. Backtrack to the Room where you found the Spiders. Head over to the East. Use the Key to get into the next room. You will encounter a pair of Giant Frostbite Spiders. 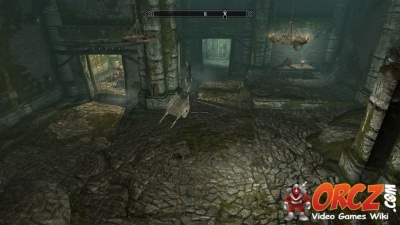 Using this room you can get back out to Skyrim. This page was last modified on 14 April 2015, at 19:20. Content is available under Creative Commons Attribution Non-Commercial Share Alike unless otherwise noted.